That's because Moon Meadow's philosophy is simple: Cattle should be rai sed naturally, living in herds with ample space to graze, allowing us to bring the healthiest product to your table. 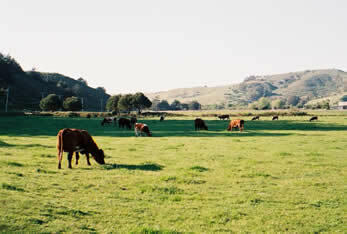 Our cattle are raised in large pastures in Pescadero, a small town known for its pristine, rural setting. By letting the sun and rain work their magic on the hills and valleys, we provide the healthiest environment for our cows. Our standards and practices include rotationally grazed/freshened pastures, and docile animals raised in spacious paddocks as the foundational part of growing our beef. A lifelong experience in agriculture and a long-term breeding program which earned recognition for quality and consistency promises a winning combination for our buyers. The rain and sun work their magic on the hills and valleys of our coastal properties near Half Moon Bay, and nature does in her own time what she designed the grazing animal to do...forage and grow into a healthy source of nourishment. We work to ensure the finest, most wholesome results of her purpose! Gary Marchi, owner of Moon Meadow Natural Beef, has a lifetime of agricultural experience. As a native of Pescadero, he has raised cattle for decades, which is why people consistently say that Moon Meadow Natural Beef is the best they have ever had.